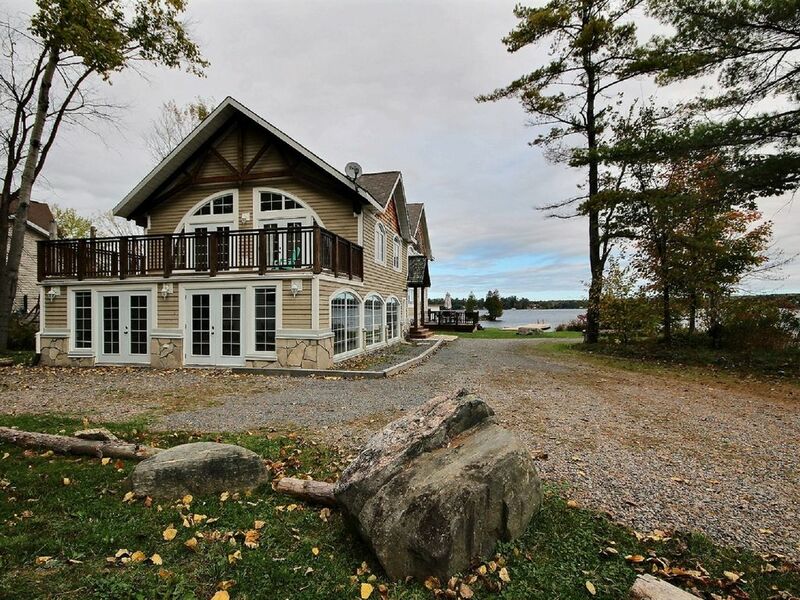 Big Beautiful Cottage on Lake Muskoka! Luxurious 4200 sqft. Lakehouse in Gravenhurst with direct access to Lake Muskoka. This cottage is fully equipped and is in excellent condition. Sleeps 16-18 people. 4 full baths + 1 half bath. 5 bedrooms + loft with two twins. 3 bedrooms are masters with ensuite baths. Two of the masters share a large private balcony. All master bedrooms have flat screen TVs. Large great room (27ft x 30ft) with billiard table, air hockey table, gas fireplace, 60" Home Theater with Surround Sound & DVD player. Lots of family fun games. Video Game area in second floor family room on upper level with gas fireplace, flat screen TV with X-Box, and large balcony overlooking the lake. Wet slip Boathouse will accommodate up to 27ft boat. Or you can tie off your boats / SeaDoos on the newly constructed 47ft dock. This cottage even has its own private island! Sandy beach and level lot. Large outdoor deck with BBQ. Gourmet Kitchen and large dining area. Open concept to lovely living room with gorgeous view of Lake Muskoka. Great to watch the Segwun sail by. Paved road to cottage and only 3km to uptown Gravenhurst. Check-in at 4:00pm and check-out at 11:00am. Fully equipped kitchen with ample supplies for large groups. Stylish front loading steam washer and dryer. Free Wifi. Canoe on-site (free). Shallow water at the beach and deep water off the dock. The cottage has unobstructed views of Lake Muskoka and is just 30 feet from the water's edge. Small private island. Fantastic golf in Muskoka - world class golfing includes Muskoka Bay Club and Taboo both in Gravenhurst - wonderful 9 hole course called The Sands Golf Club too in town. Shallow water at the beach with hard packed sand and deep water off the dock. Unobstructed view of Lake Muskoka. Small private island. Dock and boathouse fits up to a 27 foot boat. We stayed here with friends and our kids, total of 9, and it was great. Games room kept adult and kids occupied and interactive, large rooms and well equipped throughout. We went in the winter and were able to ski on the lake and take snowmobiles on the lake for a rides and easy access to official snowmobile trails few km's down the lake at the wharf. Nicely equipped kitchen with dual ovens, we couldn't get the broilers to work in either ovens but reported that and I'm sure they will be fixed. The stove top is little slow to cook on (radiant glass burners cycle on and off constantly ) making it longer process to cook certain meals, but other than that, great place to stay. Would have given 5 stars if not the oven broiler problem and slow cook-top which made it longer process when preparing meals for large group. This cottage was exactly what our group was looking for when we had a weekend getaway from the city in mind. The place provided a variety of different activities, plenty of space, fully equipped kitchen and more to help make our stay as comfortable and enjoyable as possible. Jake was also extremely helpful and attentive when we had questions and required assistance throughout the visit. Would recommend for larger groups. Amazing Cottage! Clean and Beautiful. The cottage was so clean when we arrived! And the property is to die for - right on the lake. Wonderful big rooms and lots of room to sleep plenty. Definitely will recommend this to friends and family. The property owners were a pleasure to deal with. All services worked perfectly (WiFi, etc). No complaints here. This cottage is perfect for large groups, we had a group of 15 people all together in one place. The cottage is large enough to accommodate everyone. It is clean and well maintained, there is enough beds for everyone to sleep and things to do, as well find your own space to relax. We certainly enjoy this stay and will be back soon. Although we did not stay for the whole week, but we enjoyed every moment of our two days. The is a very beautiful cottage. I would highly recommend for big families, extended families and group of friends. The cottage is very neat and clean with lot of space. The cottage is equipped with all the necessary appliances to make your stay very comfortable. The washrooms and kitchen are spacious.